(CBS) Doctors and engineers have joined forces to bring the world its first lower jaw transplant, using a prosthetic jaw made by a 3D printer. An 83-year-old Belgian woman underwent the operation last June, after suffering from an infection that rapidly ate away her jaw. In order to keep breathing, chewing, talking and feeling in her jaw, the patient had no option other than the complete removal of her mandible (lower jaw). Scientists at the University of Hasselt BIOMED Research Institute in Belgium developed a custom made implant using 3D printing of titanium powder. The design, processing and production of the implant were all done digitally, and the implant was ready in just a couple of hours. Weighing 107 grams, the prosthetic jaw was just a bit heavier than a natural lower jaw, but to no disadvantage. 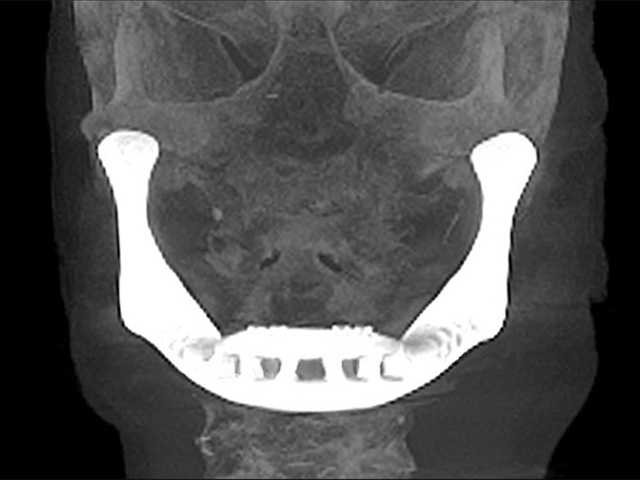 The implant was coated with "artificial bone" and polished, fitting the patient perfectly. "Computer technology will cause a veritable revolution in the medical world. We just need to learn to work with it," Dr. Jules Poukens, University professor and part of the development team, said in a written statement. "Doctors and engineers together around the design computer and the operation table: that's what we call being truly innovative." The surgery restored not just the function but also the contour of the face in the patient. According to Xilloc Medical, the company that created the jaw, the day after the surgery the patient was already able to function normally with adequate speech, swallowing and movement. The patient needed antibiotics to heal properly after treatment.